Where can I buy a pair of seahorses for a friend's aquarium? I defy anyone not to love them! My friend's already got the large sea water aquarium - and he's got a birthday coming up. So I thought I'd buy him something I really like and can enjoy watching every time I visit him. 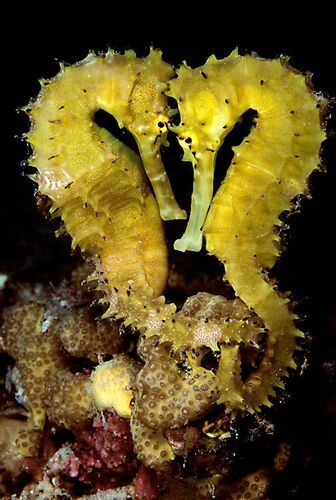 How long do seahorses live for? What should he feed them on? Any special needs? I've never seen seahorses in any pet shop so I have to wonder why not? Is it illegal to buy and sell seahorses in Britain? If it's not, then how much does a pair cost? And where can I buy some?